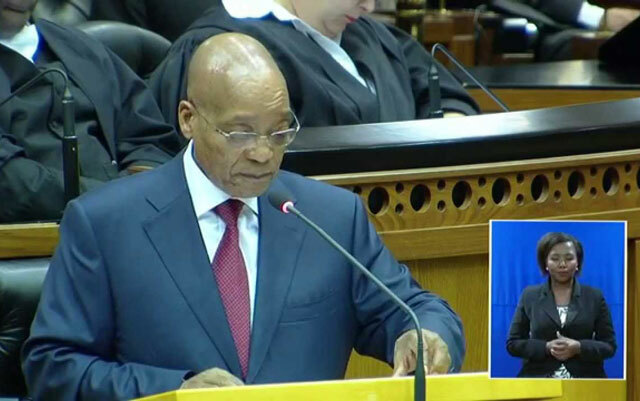 President Jacob Zuma has lamented the abuse he faces in the national assembly every time he answers questions. Following his question session in the national assembly, Zuma told MPs that it would be unfair for him to step off, without raising his concerns. “Each time when I come here, I am abused by members of your house. Instead of answering questions, I sit here being called a criminal, a thief,” he said. He called for parliament to do something about it. He should not have to face people who did not respect the house, Zuma told MPs. “I have to sit here and wait for these discussions. Your house must do something. If this house is not interested in me answering questions, you must say so, then don’t call me,” he said, before stepping off the podium. Earlier in the sitting, Economic Freedom Fighters and Congress of the People MPs walked out of the sitting, refusing to be addressed by Zuma. “We’ll come back when the criminal is gone, we are not going to listen to the criminal,” EFF leader Julius Malema said. Zuma’s session in the national assembly was first marred by the Congress of the People’s refusal to allow him to speak, with Willie Madisha disputing the president’s “honour”. Hey Zuma! You are NOT doing national service, you are just another in a long line of VOLUNTARY ANC political hangers-on and if you don’t like appearing before the country’s representatives to answer questions (Which you receive in advance by the way, unlike the UK parliament where the PM must answer them on the fly)) then it’s high time you got somebody to fill in a resignation form on your behalf and you put what passes for your signature on the bottom of it and just bugger off! ASAP. Now you are unhappy are you? So just what happened to that sly smirk and insulting giggle you have been contemptuously showing us these past years that you have been disgracefully occupying the highest position in the country? Be a man and take yourself off the political map before you cause this country any more economic damage both locally and internationally. Zuma, you are a disgrace to the ANC, the country and even to yourself, hard as that may seem. My 6 year old neighbours son would do a better job of running this country. And he’s got Down Syndrome !